Ok, fine, we thought. It’s a fair point. So let me tell you what we’re doing first, then try to explain how it’s going to work. Stuart Cosgrove, who sketched out that potential running order for a new hour-long news broadcast in his article last week on Bella, is going to guest edit a special ‘Scottish Six’ edition of The National, which we’ll publish on Tuesday. It’ll be structured as if it’s going out on television, the balanced mix of Scottish and international stories we’d like to hear when we sit down with our tea of an early evening. It’ll be his ideas, similar to those proposed on this site, but fleshed out: full of the detail. We hear the BBC are making three pilots for their proposed flagship programme, but each sounds depressingly similar. We don’t have the film crews – or the time! – to make one ourselves, so we’re going to do it slightly differently. But, while we can try to create the illusion of a broadcast experience, and use little visual tricks so it looks distinct from our usual stuff, it’s not really the format that’s important: it’s the content. It’s about proving that Scotland is rich enough in stories and talent and ideas to support an hour of news each day. We believe it is. And what’s certain is, as Stuart wrote here last week, that none of the stories we’ll be telling would see the light of day on the current news service from London. That’s kind of the point. Of course, some will never be convinced. Those who think the Scottish Six is a dastardly SNP plot to further the cause of independence – well, we suspect they’re a lost cause. And, for others, we know the BBC has probably burned their bridges (it ought to be recognised that in this they are at least trying to mend them, however clumsily). But for those, though, who worry about having to watch another half hour of gruelling court cases, the latest Rangers/Celtic non-news and whatever Willie Rennie’s up to – well, we’re trying to prove it doesn’t have be like that. The rough idea is that each two-page spread of the paper will account for four minutes of an hour-long broadcast (some the fixtures that won’t fit, like our regular puzzles and TV listings, will be in a pullout section). We’ll take you through the hour, with special features that look at Scotland’s legacy across the world and set-piece interviews with major international figures. We’re throwing a lot of ideas at the wall – we hope that most will stick. And we’ll also attempt to go behind the scenes: Stuart will write notes on how each segment could be put together, and what resources might be needed to produce it. We’ll be trying to show what could be done by a properly funded independent news team, based in Glasgow but with access to the BBC’s international resources, who are given the freedom and flexibility to be a little bolder with their choices. Just one example: we’re making a point to commission pieces by independent filmmakers, who may know their subject matter better than an in-house camera crew and journalist sent out by their bosses to explore somewhere different each day. 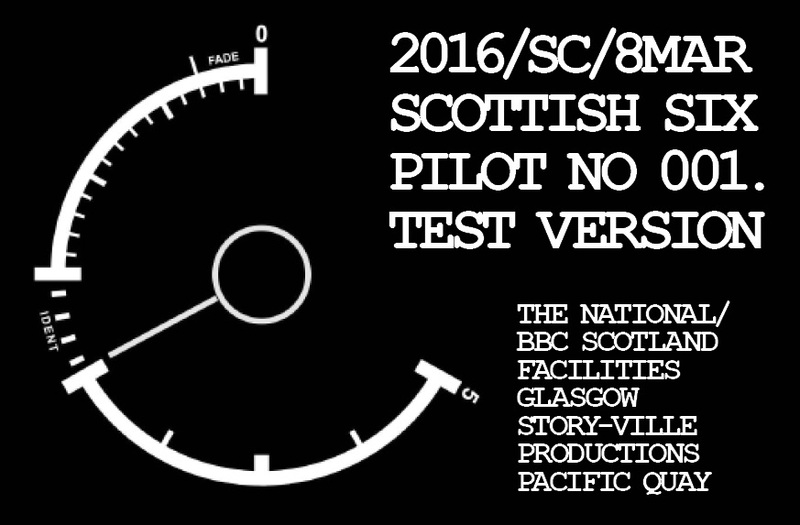 Scotland’s got talent: why can’t our public broadcaster use it? Now that’s some transition. To us, the Scottish Six simply makes sense – and it ought to be done right. That’s why we’re helping to realise Stuart’s alternative pilot, as an example of what we think possible in Scottish broadcasting. Excellent! Totally approve. Well done. Sounds a good starting off point ! We do not want to let this idea get watered down. Alan, there is no chance of it being watered down, as it would never be allowed to reach a moist state, let alone a wet one. While I’m well aware that there’s more than one Alan Bisset(t) in the world – my Dad for a start – I’ve never seen another one commenting on Bella Caledonia. So just to make it clear to everyone, in case they care, that the person above is not the same Alan Bissett as me, the writer fellow. This appears to be a striking coincidence. Of all people I never expected you to be homophonic, Alan. Great stuff guys. Look forward to an expression of talent. Burst forth! Anything with less celebs and more real people will be a start. If it was planned properly, the occasional half hour-long exposé along the lines of World in Action wouldn’t go amiss when there’s a worthwhile topic (such as renewable energy, or corruption in business sectors). There’s a world on our doorstep, but it gets boiled down to farming, fishing, football and neds. It’s got to change. I just cannot WAIT !!!. Personally I welcome the idea but would have liked first to have heard from others ( journalists and the public) on ideas for running order . I think Stuart Cosgrove would agree that the general public are not short of imagination, ideas and humour . Good luck and look forward to this edition of the National . How about a slot near the end say, for a ‘HardTalk’ from a Scottish perspective, with say, Derek Bateman the hard man? Best of luck with this. However, with the same old loony yoons at Pacific Quay a Scottish Six will be sabotaged to fail. Best course is for everyone to cancel the BBC licence fee, destroy BBC Scotland and start independently afresh. Have a look into RT news,excellent inmo with a lot of good informative slots e.g.”The Keiser Report”,his slot alone would go down a bomb and maybe waken up a lot of the feet draggers,he really goes to town on the City of London/Banking crooks no messing about. Maybe it’s just me? Am struggling to reconcile ‘We’re not sure that Scotland needs a Scottish Six’ with the next para ‘ To us, the Scottish Six simply makes sense’. Which? Don’t hold your breath! This is just repackaging a toxic product. Even if a scottish six did provide something a bit better than the crap we’re subjected to on a daily basis, our so called scottish six would turn on Scotland again at the drop of a hat in the event of an indyref 2. Tired of hearing the apologists, fantasists and optimists singing ”Always look on the bright side of life”. The BBC is Scotlands enemy and that will not change, even with a shiny new wrapper. Let it go to ground! Just finished reading ‘London Calling ‘. The BBC is “… IN Scotland not OF Scotland . It does not reflect the views of Scotland but instead lectures Scotland. ” and ” It isn’t informing the Scottish public , rather it is trying to influence us .”-this during the referendum but a Scottish Six would be seen by ‘London ‘ as leading in an Indy direction and is likely to come under the same sort of supervision . Scotland needs control of say six entire channels not a pisstake of an hour from the tainted BBC and their unionist dogs. If there is to be a Scottish Six, I hope it won’t be left to the BBC to produce. Let them broadcast an hour-long news programme on BBC1 produced by an independent company. If they feel the need to produce a news broadcast, let them continue with the Strathcouthie Parish News at 6.30, but on BBC3. Strange that the letter “i” didn’t appear in the post above. I noticed one of the English tory rags “Mail” or “Express”, I can’t recall which, today had a front page headline along the lines of “The Scottish people don’t want a Scottish Six”. I don’t buy those rags but does anyone know what that headline was based on? From memory of a cursory glance at a newstand this morning the front page of the Mail (?) referred to 1,000 complaints. Apparently that number is higher than usual. The above URL to ‘The Lonely Onlys’ works at the moment when you copy and paste the connection but also add the needful vowel to the word “w_ngs”.